Grab this FUN and CUTE emergent reader HERE! 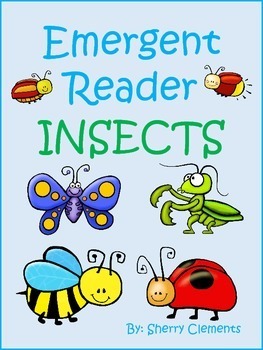 This emergent reader, “Insects” is connected to several CCGPS listed below. This 18 page book is designed so that you can copy the book, cut it in half, staple, and then it is ready for use. The 18 pages include a title page “Insects” then each of the remaining 17 pages contains black and white pictures at the top of each page and a sentence under the picture. This emergent reader focuses on a variety of sight words including: here, are, some, have, has, is, it, this, can, you, be, and, the, like, pretty, up, me, jump, at, what, and do. ***The pages are NOT numbered to give the teacher flexibility of using the pages wanted/needed or to make books with fewer pages for some students which provides DIFFERENTIATION. Page 2: Here are some insects. Page 3: Insects have 6 legs. Page 4: Insects have 3 body parts. Page 5: An insect has antennae. Page 6: This insect is a butterfly. It has wings. Page 7: An ant is an insect. It can bite you. Be careful! Page 8: A bee is an insect. It can sting you. Watch out! Page 9: A dragonfly is an insect. It is fast and pretty. Page 10: A firefly is an insect. It lights up! Page 11: A fly is an insect. It bothers me! Shoo fly! Page 12: A grasshopper is an insect. It can jump. Page 13: A ladybug is an insect. It is red and black. Page 14: A moth is an insect. It likes the light at night. Page 15: A praying mantis is an insect. It has long legs. Page 16: A beetle is an insect. Beetles are everywhere! Page 17: Is a spider an insect? No, it has 8 legs! ELACCKRF1c. Understand that words are separated by spaces in print. ELACCKRF3a. Demonstrate basic knowledge of one-to-one letter-sound correspondences by producing the primary or many of more frequent sounds for each consonant.